Over/Under: Over 187.5 at 1.90 Bet Now! 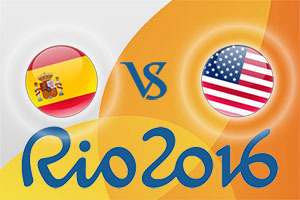 Spain versus the United States has been the last two finals of the Olympic Men’s basketball tournament but in 2016, they meet in the semi-finals. This is down to the slow start that Spain endured in their group and the log-jam that occurred in Group A. A second placed finish put them in the American’s half of the knockout round draw, denying the world a third consecutive Men’s basketball tournament final in a row. Which is probably a good thing for most people but not so good on the team that loses this game. Spain booked their place in the semi-final with a comfortable win against France, taking every quarter. This was a game between close rivals, who have both tasted success in big games against each other in recent times, but Spain looked in full control at all times. Pau Gasol is leading the tournament in rebounds and is second in blocks, and he is also the main man for Spain with respect to points, but it was Nikola Mirotić that drove the Spanish side home against the French, bagging a total of 23 points in the win. Gasol provided 8 rebounds in the win. As for the USA, they demolished Argentina and the Americans have the look of a squad that knows how to win this tournament with comfort and ease. Kevin Durant grabbed 27 points in the win and with the USA looking as though they could score at any point, and with any player, it is still extremely difficult to look beyond them looking to back a team at this tournament. This may take the edge off of the basketball betting options slightly, but that shouldn’t detract from the talent or skill on offer from the American side. How many points will USA win by? The only real issue people have heading into this game is how much the USA will win by? While the two previous finals can’t be taken as a guide for this game, the Americans haven’t really hammered Spain in these two games. This means taking Spain at +13, which is on offer at odds of 1.90 is likely to add some excitement to the game. The Americans should take the game with a bit to spare but Spain will be looking to push them as hard as they can. With respect to the Over/Under market, going OVER 187.5, which is provided at odds of 1.90, could be a bet that adds some excitement to this semi-final. Bet Now! The Race to 20 Points isn’t that tantalising but America can be backed at 1.31. The double-result of USA at half-time, USA full-time can be backed at odds of 1.33. A tie at half-time and USA winning at full-time carries odds of 17.00. The game starts at 1930 BST on Friday 19th of August.